It is without a doubt the most difficult card I make... therefore I stick to simple, easy, with just a tad of a flare. When I do make them, I cannot ever seem to make them in a bundle, so they are waiting for me when I need them, I seem to make them on an as needed basis. I chose the colors Baja Breeze, Crumb Cake, Soft Suede & very Vanilla because I thought it was elegant. And its not so much gender specific. 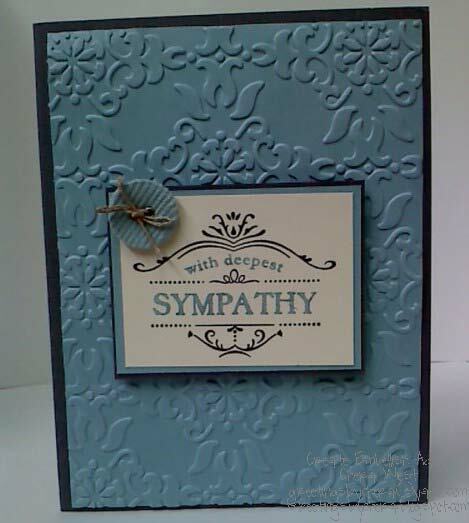 Using the Vintage Wallpaper embossing folder on the Baja Breeze gave the card depth and personality. .. or at least in my opinion. 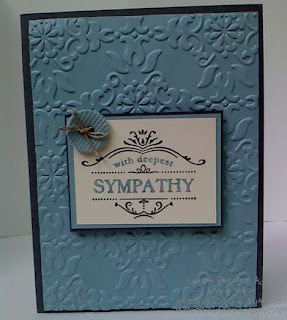 I am actually using Grey as the card stock here, met with the Baja Breeze. This is definately more masculine in my world, which is fine, as its going to this family, who lost 7 of their children in a house fire in Perry County, Pennsylvania last week. I grew up in the same county, and though I have been gone from there for a while, the quiet still mountainess air still makes me say "I am home", when I do return. Its a tragedy even if you didn't know the family. Its a farming community, and they are close. So without a second thought, I have gathered some cards, clothing & donations for the family, who are putting 7 of their children to rest today. May god bless them. What a tragedy that was. We saw it on the news in Canada and my heart went out to this family. Omgggggg I can't imagine surviving that. They will definitely be in my prayers! 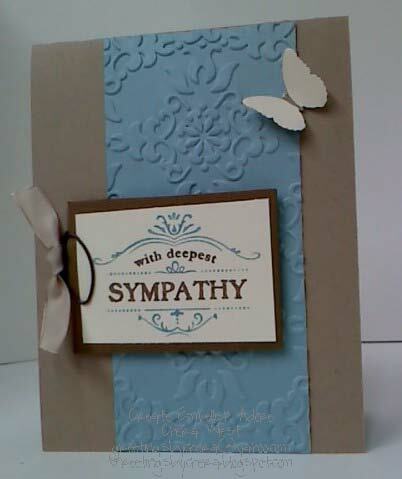 I agree sympathy cards are so hard, and this one would have seemed nigh on impossible, but you did a great job! I had not heard about this tragedy. I believe it would be unbearable to go on - even though the remaining child will need lots of help. I don't understand why things like this have to happen.